Either it's been a little cooler lately or I've gotten used to the heat or a little bit of both, because I've been able to do some cooking lately. One of the few good things to come up with this unseasonably hot weather we are having is that I have been inspired to create meals that require little cooking, or minimal stove top cooking at most. Luckily, most of the vegetables that are in season right now don't require much cooking to make them tender and delicious. Salads come in handy, and this time of year I will buy bread rather than making it myself. Sandwiches are a great no-cook meal. But I do miss baking. Specifically, I miss making pizza. When it's this hot outside the last thing I feel like doing is turning on the oven, especially to the high heat required for pizza. In all honesty, I don't really feel like eating pizza when it's this hot. I just miss making pizza dough. How lame is that? 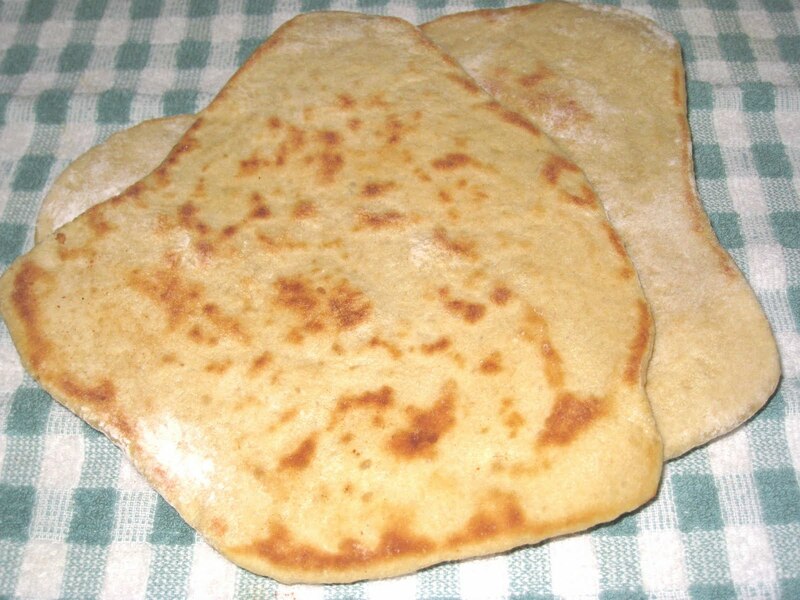 Last weekend I was looking through the latest issue of Vegetarian Times and saw a recipe for skillet pita bread. That sounded promising so I marked the recipe (I know, I know, I said I was through with VT recipes, but I just can't seem to help myself) . But when I looked more closely I discovered that it called for several risings and it looked like it would be an all-day project. Not what I would call a light summer project. I am still interested, but will wait until one of those lazy Sundays when I have all day to make bread. It did get me thinking, though. If you can grill a pizza, why can't you make it on the stove top? A quick surf through the internet told me that you can indeed. I looked at several of the methods described and decided on the one that seemed the easiest, with the best possibility of success. It did feel good to get my hands deep into the dough. I made my usual pizza dough, divided it in half like I usually do, and left it to rise in the refrigerator for several hours. Come dinnertime, I pulled one of the balls out and left it on the counter to come to room temperature. I didn't have my usual pizza ingredients on hand since it's been so long since I've made a pizza, but I did have some fresh tomatoes and one of my current favorite cheeses - Swiss Gruyere. I did have some freshly-grated Parmagiano Reggiano as well, along with my usual pizza mixture of thyme, oregano and basil. The thing about cooking pizza on the stove is that you have to cook each side. So the toppings don't go on until after you have cooked one side and turned the dough. In order to get the toppings to melt, you have to cover the pan, and the toppings don't really brown. Which is my way of saying that, as a pizza, the result was less than spectacular. But the cooked dough was enough of a success that I started considering for what other purposes it could be used. The first thing I tried, after I made two small pizzas and had run out of pizza-style toppings, was that little bit of leftover chocolate frosting I had almost forgotten about hiding in the back of my freezer. Result? Unbelievably delicious. I'm not usually a fan of dessert pizzas, but this was something else entirely. I wasn't ready to give up on the pizza yet. I was the lucky recipient of tomatoes, Swiss chard, and fresh basil from a friend's garden, which I supplemented with fresh mozzarella to use with the second ball of pizza dough. It was an improvement over the previous night, but it still didn't thrill me. But I was thrilled to be kneading dough again, so I thought I might work on the dough and forget the pizza. The result was quite nice. The dough turned out soft and chewy and worked really well with the baba ganouj I made with a beautiful local eggplant I found on sale at Treasure Island. I am eager to see what other things I can find that would go well with it. The beauty of this recipe is that it takes about 20 minutes to make the dough, and then it just sits in the refrigerator for up to two days before you have to use it. Since I have been trying avoid as much processed food as possible, it is nice to have found something that I can make quickly and easily, without having to heat up my apartment in the process. So far, I have used my pizza dough recipe just as it is, but it could use some tweaking. If it turns into anything, I'll post a recipe. Or maybe I'll find some actual flat bread recipes. If there are any out there that are easier than this.